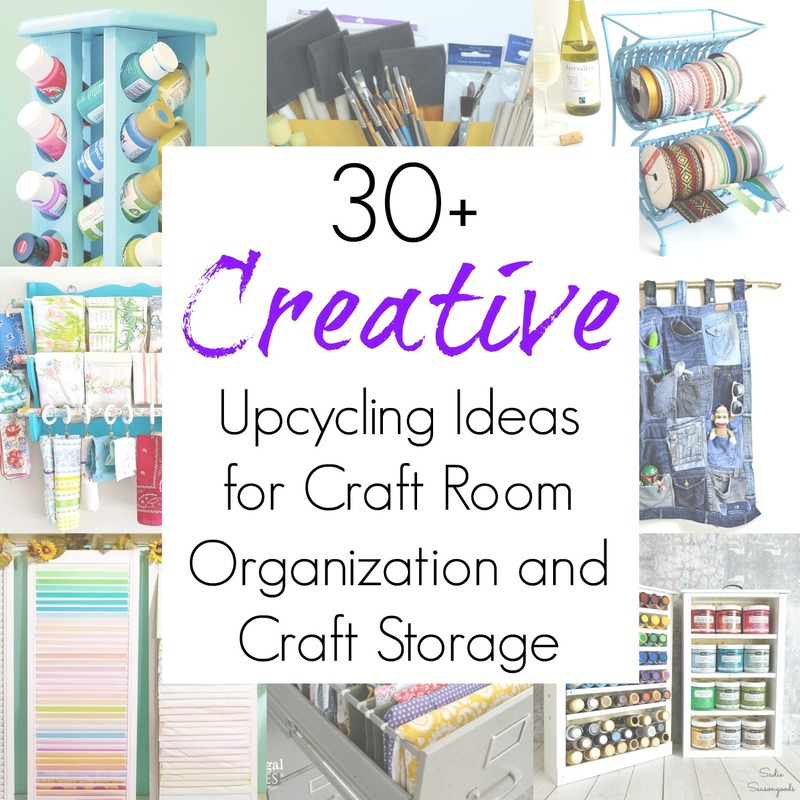 Craft room storage and organization are a constant struggle for me, so it’s on my mind a lot. And this entire post started out when I found a utensil caddy while thrifting. At first I wasn’t sure what I’d do with it, but I realized later on that it would make the PERFECT paint brush holder. When all was said and done, I decided to create a matching set of craft room storage with my unrelated, unmatching thrifted treasures. This post contains affiliate links for your crafting convenience. Stencils used in this project have been provided to me free of charge, but all opinions are my own. As part of the makeovers for my craft room storage pieces, I wanted to paint them (of course) and stencil on some designs. I discovered a new-to-me online stencil retailer (Stencil Revolution – click here to check out their store!). For this project, I tried out a couple of their vinyl stencils – Cherry Blossoms and Crafters Gonna Craft! So, here’s my vision- I decided I wanted my pieces to have the look of chalk art without actually using chalk. Basically, I’d spray paint them black and then lightly stencil on the words and flowers using my Stencil Revolution stencils so that they looked like chalk, not paint. 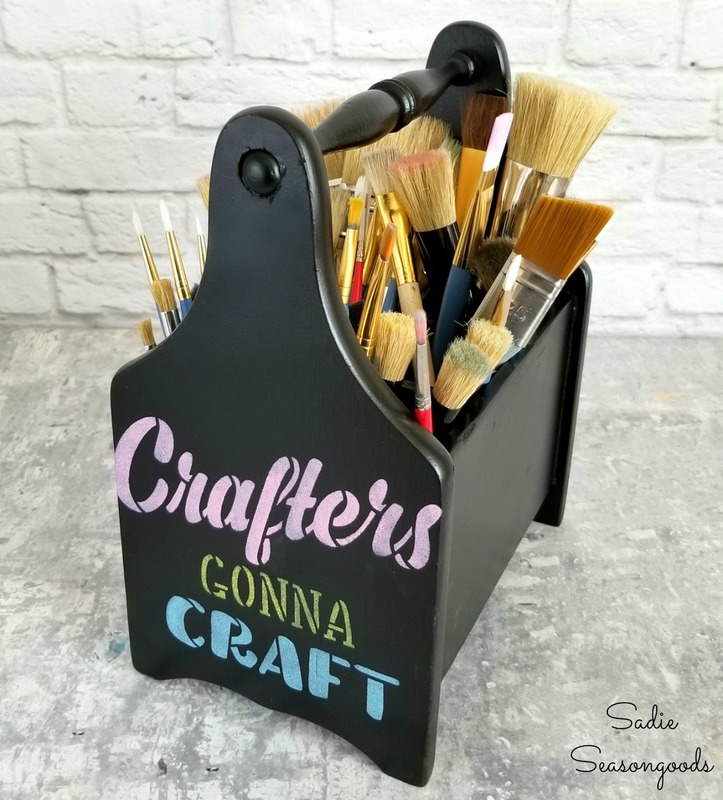 While I could have painted them with actual chalkboard paint, I cheated and used black satin spray paint on the utensil caddy and other thrifted pieces. After the paint had dried, I gathered my stenciling materials (painter’s tape, pastel craft paint, my favorite stencil brushes, etc.). Like I mentioned before, I used a feather-light touch during the stenciling. I really wanted the pastel craft paint to be somewhat sheer and uneven, like chalk art would be. And the Stencil Revolution stencils did NOT disappoint- especially given how affordable they are. Here are all my thrifted pieces – the utensil caddy, paper holder, and wooden box. 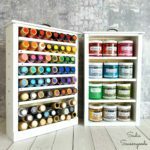 I LOVE how my faux “chalk art” turned out on my new craft room storage set. And I didn’t have to deal with specialty paints or materials – I simply used paints I already had and high-quality stencils. Even better? I still have plenty of paint left and the Stencil Revolution stencils are endlessly reusable. So, I’ll be able to add more and more thrifted pieces to my Craft Room Storage set as I find them, giving them nuanced versions of my chalk art finish. And just as I had originally hoped, the utensil caddy was simply PERFECT for upcycling into a paint brush holder. Both my craft paint brushes and stencil brushes fit inside and I have room for more as I add them. I also love that it’s super portable and instead of picking and choosing brushes for projects, I can just tote the whole thing around. 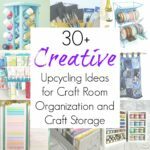 If you’re interested in even more craft storage ideas, I’ve got a fantastic collection of upcycling ideas here. I hope you’ll check it out before you go! I love what you did with these old wooden holders. 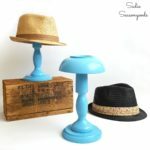 So often I see them at thrift stores and they look so sad and forgotten , but this idea is simple and brings new life! Thank you for posting. I may try it too! I’ve been trying to decide on something to keep my paint brushes (and etc!) in, and now I know. Hope I can find one soon! Sending good thrifting vibes your way and fingers crossed!! Great post! Looks easy, fun and practical. Thanks for the stencil info too. That’s awesome, CC!! Happy crafting!